…is a fairly simple task, but there are a few tricks that can make it easier. 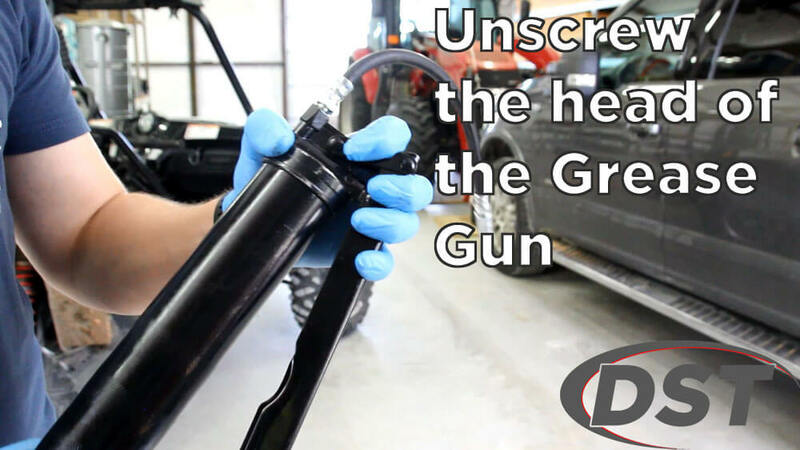 Whether it’s your first time using a grease gun, or you’ve already reloaded it but no grease is coming out, this video and step-by-step instructions will detail how to load and prime a grease gun. 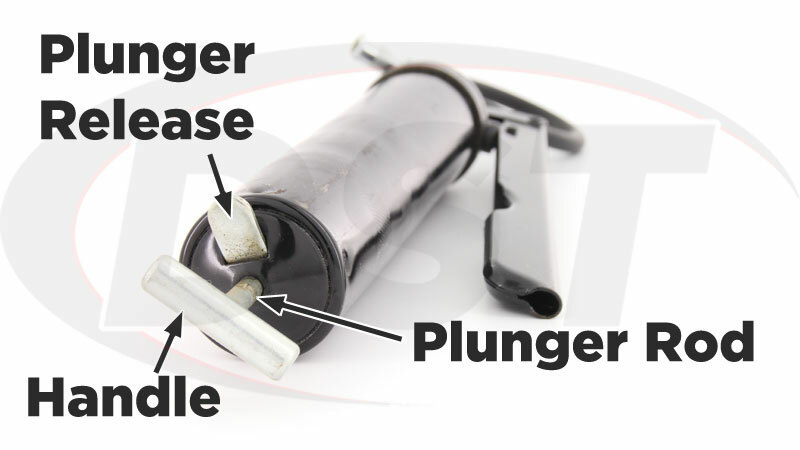 The process of loading a grease cartridge is very similar with different styles of grease guns and we will be demonstrating with a manual lever grease gun, since it is one of the most common types found in garages and barns everywhere (and it’s the type we have in stock at Suspension.com :). So we just finished some tractor maintenance and our grease gun is empty. Lets get started. Loosen the head of the grease gun. Pull the plunger handle all the way back and lock it in place. 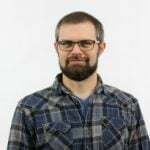 *There could be a notch in the end of the grease gun to set the plunger rod or a metal release tab that you push the rod toward. Finish unscrewing the head and remove the spent grease cartridge. *You can push the plunger forward to eject the spent cartridge without messing up your manicure. Take a new grease cartridge and remove the plastic cap. Open-side down and metal tab up, insert the cartridge in the grease gun. Pull off the metal tab. *Be careful not to allow any loose metal to fall into the grease. Screw the grease gun head back on then loosen it one or two turns. 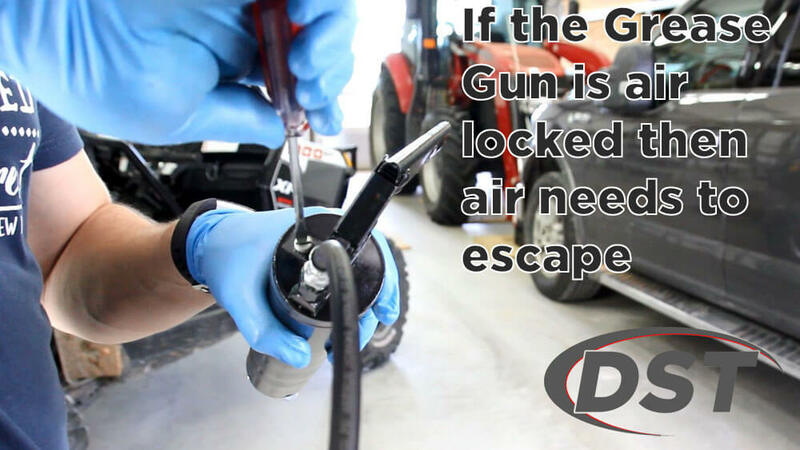 *This will allow any air between the cartridge and the grease gun head to escape. 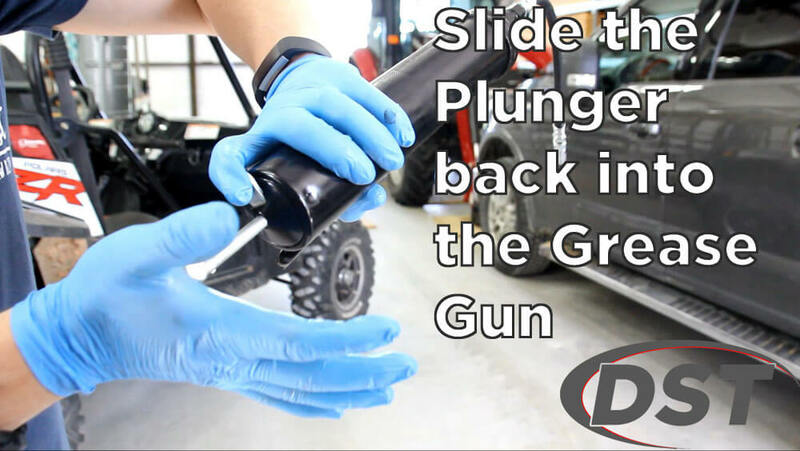 Holding the back end of the grease gun carefully release the plunger and slide it into the gun. 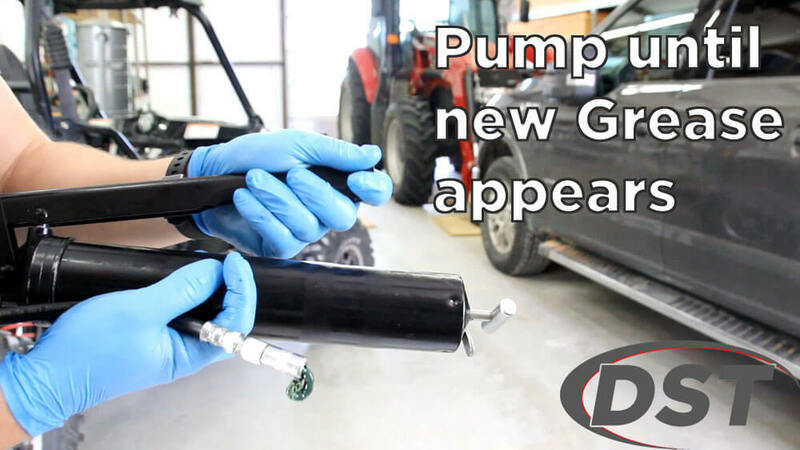 Tighten the head of the grease gun and pump until grease comes out. *If you are using a different type of grease than before, pump until you see the new grease. If nothing is happening then the grease gun is probably air locked. This means that there is still an air pocket between the grease and the head of the grease gun. This is a common issue (We also experienced this at DST headquarters while making our video) but there are two easy solutions. 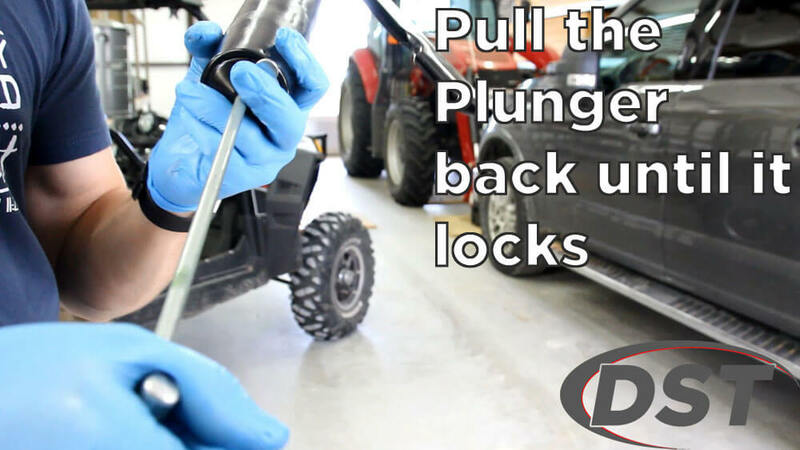 If your grease gun has an air release then you can loosen it, pull the plunger out, and push it back in. This should push any air out of the grease gun and then grease should be flowing just fine. If your grease gun does not have an air release, or you don’t want to bother with finding the tool to loosen it, then you basically want to repeat steps 7-9; unscrew the head of the grease gun about two turns and prime the gun with the plunger, then it should be working fine. 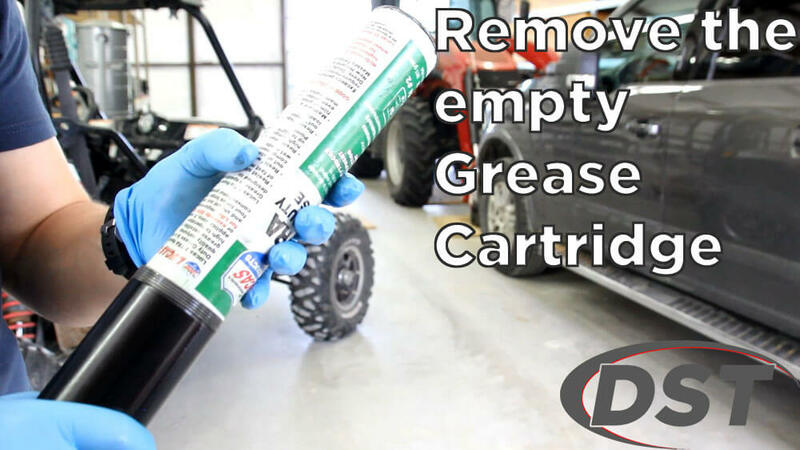 Make sure you are using the right type of grease for your application. 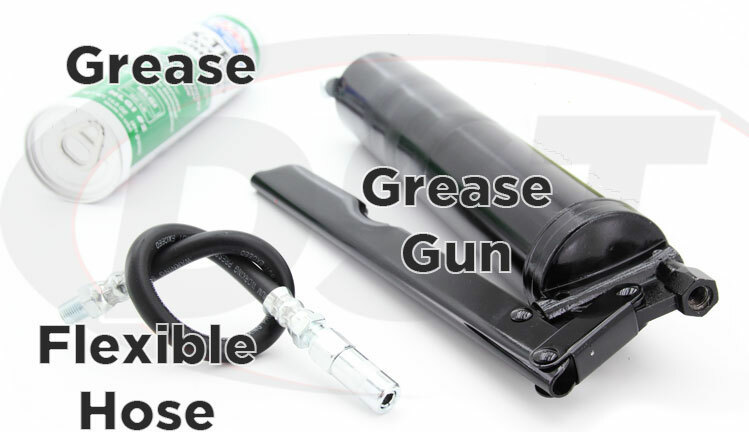 Best practice is to use the same kind of grease in one grease gun since there will be grease left in the gun from previous use. 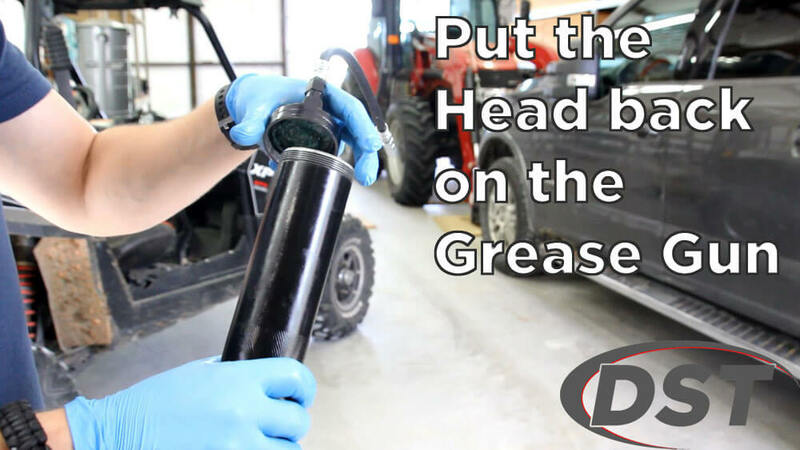 Clean the grease fitting and the nozzle of the grease gun before use. Pump some grease through the nozzle and wipe it off with a rag. 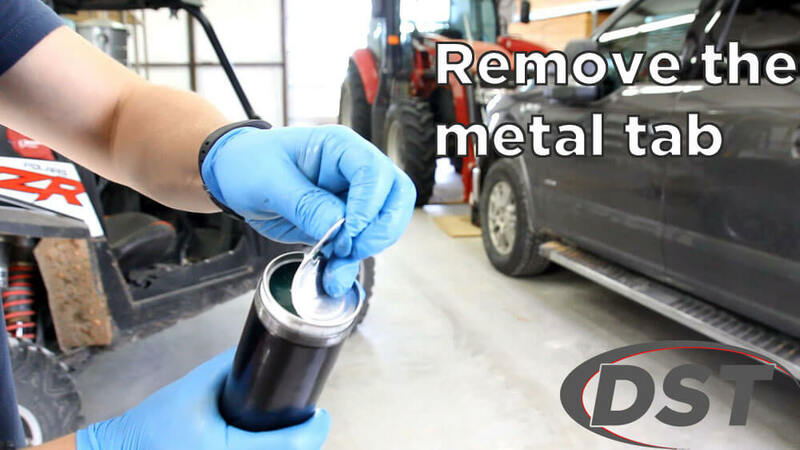 When finished, depressurize the grease gun and store horizontally in a cool place to keep the oil from separating. Cover the nozzle between uses so contaminates won’t enter whatever you grease next. 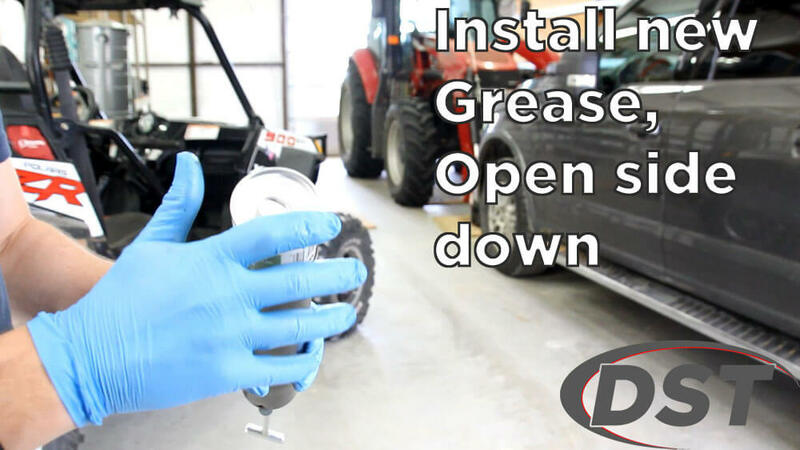 If you’re loading up your grease gun for some vehicle maintenance you can check out our detailed How to Grease Ball Joints or How to Grease Tie Rod Ends articles, which also explain how to use a grease gun to lubricate sealed ball joints. 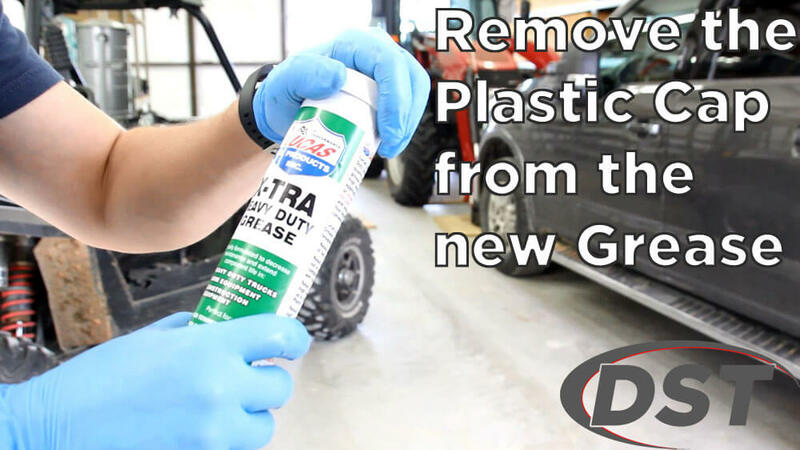 If you need to purchase a grease gun or replace your current one, Suspension.com offers a grease gun combo or mini grease gun combo that include Lucas X-tra Heavy Duty or Marine Grade grease and have options for flexible hoses to make hard to reach maintenance easier. If you have any other tips or tricks we would love to hear from you in the comments section below! If you want to take another look at something then head back to the table of contents. I prefer to use a pneumatic grease gun. Is the process of loading grease the same? Do you offer pneumatic or pistol grip (full size) grease guns? I really hate lever grease guns. 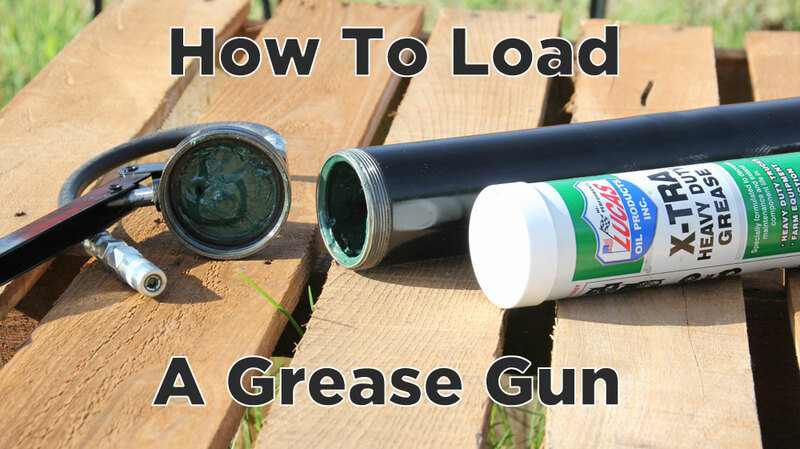 If the grease gun uses a cartridge then these steps should get you through the process. 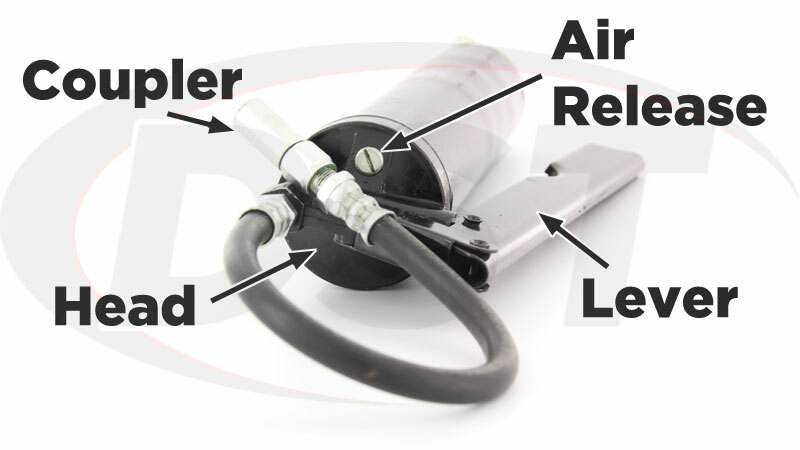 One convenient difference might be that most pneumatic grease guns have a simpler air release valve, which would make clearing any air pockets easier. We are planning on stocking a pistol grip grease gun soon for those who don’t like the lever style. Thanks for the question David.